On September 27, 1959 the Green Bay Packers not only kicked off a new regular season but a significant new chapter in the franchise’s history. Of course, no one knew at the time how significant that chapter would be, but the team’s new head coach and general manager, Vince Lombardi, was highly regarded and brought a new attitude to Green Bay. The Packers had once been one of the league’s better clubs, regularly contending and winning six NFL Championships. But the last of those titles had come in 1944, six years before the club’s founder and original coach, Curly Lambeau, resigned. The decade of the 1950s had not been a good one, with just two break-even seasons and a dreadful 1-10-1 record under Ray “Scooter” McLean in ’58. There were whispers that the league’s last small-city Midwestern team would not survive much longer. Lombardi, most recently the offensive coach of the New York Giants, was brought in to restore the franchise to respectability and was granted the necessary authority to reshape the club. Lombardi had talent to work with, including veteran Pro Bowl center Jim Ringo to anchor the offensive line, end Max McGee, and DT Dave Hanner. There were promising young players available to develop that included QB Bart Starr, FB Jim Taylor, G Jerry Kramer, OT Forrest Gregg, and LB Ray Nitschke. The underachieving Paul Hornung was penciled in to become an option halfback, in the manner of Frank Gifford of the Giants. Through trades, DT Henry Jordan, DE Bill Quinlan, and G Fred “Fuzzy” Thurston were added, as well as 34-year-old veteran safety Emlen Tunnell from New York to lend leadership to the defensive backfield. A five-year veteran quarterback, Lamar McHan, was also obtained to start ahead of Starr. There were 32,150 fans in attendance for the opening game at Green Bay’s City Stadium. 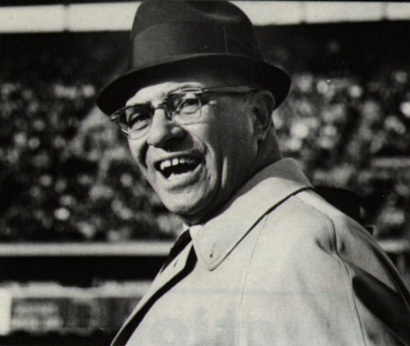 The Bears, coached by owner George Halas, were seven-point favorites and were coming off an 8-4 record in 1958. Chicago was known for its running game, featuring FB Rick Casares and HB Willie Galimore, on offense and a tough defense that included DE Doug Atkins, linebackers Bill George and Joe Fortunato, and DB J.C. Caroline. The Bears scored first with a 46-yard field goal by John Aveni late in the second quarter. Meanwhile the Packers, with McHan at quarterback, managed to drive inside the Chicago 20 on four occasions through the first three quarters but came up empty each time. Paul Hornung, the team’s placekicker as well as halfback, missed two field goal attempts, from 19 and 14 yards, that were both wide to the left. A third attempt never got away due to a bad snap from center. The fourth drive was thwarted by an interception. On the third play of the fourth quarter, Aveni kicked his second field goal from 42 yards out to make it 6-0 in favor of Chicago. However, thanks to Max McGee’s punting with the wind behind him, the Packers were able to put points on the board during the final period. Midway through the fourth quarter, a 54-yard punt by McGee was fumbled by DHB Richie Petitbon after he had returned it nine yards. The ball was recovered by Jim Ringo at the Chicago 26. From there, Jim Taylor and Hornung alternated carries until Taylor ran five yards for a touchdown on the sixth play of the drive. Hornung’s extra point put the Packers up by one. With 2:21 left on the clock, McGee, helped by a 30 mph wind at his back, punted 61 yards to pin the Bears down at their two yard line, where the kick went out of bounds. Shortly thereafter, Dave Hanner tackled Bears QB Ed Brown in the end zone for a safety as he searched for an open receiver. It was enough to seal the upset 9-6 win for Green Bay. The new coach was carried off the field by his players after Ringo handed him the game ball (pictured at bottom). It was a stunning triumph for the Packers, matching their victory total of 1958. Chicago’s well-regarded running game was held to just 75 yards and two first downs by the surprisingly tough Green Bay defense, where the line play was outstanding and linebackers Bill Forester, Tom Bettis, and Dan Currie played notably well. Green Bay led in total yards (262 to 164) and first downs (16 to 10). Each club turned the ball over twice and was penalized five times. Jim Taylor (pictured above) led all rushers with 98 yards on 22 carries and Paul Hornung added 61 yards on 19 attempts. Lamar McHan completed just 3 of 12 pass attempts for 81 yards while Hornung threw two option passes and was successful on one for 20 yards. No Packer caught more than one pass, with Max McGee gaining 61 yards on his to lead the club. Chicago quarterbacks Zeke Bratkowski and Ed Brown combined for 10 completions in 23 attempts. Rick Casares gained 29 yards on 11 carries and Willie Galimore was right behind with 28 yards, also on 11 attempts, and led the team in receiving yards with 37 on three pass receptions. Flanker Jim Dooley caught 4 passes for 36 yards. The opening-week win for the Packers was the first of three straight before a five-game losing streak (including a 28-17 loss to the Bears in Chicago) dropped their record to 3-5. However, the emergence of Bart Starr as starting quarterback was part of a four-win rally to close out the season at 7-5 and a tie for third place in the Western Conference with the 49ers. The Bears recovered to end up at 8-4 and second in the conference. Paul Hornung led the NFL in scoring with 94 points as he emerged as a major point-producer – he also led the team with 681 yards on the ground. Jim Taylor lost time due to burns sustained during a home kitchen accident but showed his potential with 452 rushing yards. The basis was laid for the Packers to win their first of three straight Western Conference titles the next year and five league championships overall under Lombardi. To say the least, more than respectability was achieved.